There is no reason to waste your resources sending email to people that don&apos;t want to receive the message. Additionally, if you do not honor unsubscribe requests you are in violation of the law and opening yourself up to potential problems and complaints. Relevant Tools makes it easy to automatically handle unsubscribe requests. Every email that&apos;s sent by Relevant Tools has an unsubscribe link automatically inserted into the default footer. If you don&apos;t like the default footer, we do offer the option to customize your footer. Anyway, each person receiving your message has an unsubscribe link that will place them on the unsubscribe list with a single click. 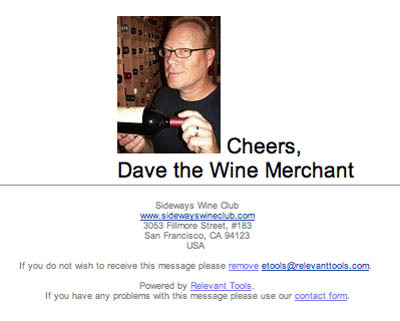 Dave Chambers of Sideways Wine Club does an excellent job of maintaining his email lists and offers his customers a smooth integrated unsubscribe process. The example below shows the unsubscribe footer from one of his email messages. When the unsubscribe link is clicked on, in the footer, the email receipient is immediately added to Dave&apos;s unsubscribe list and taken to his custom confirmation page, shown below. If you don&apos;t want to setup a custom confirmation page on your website or you don&apos;t have a website, you can always use the default page offered by Relevant Tools. On the Relevant Tools account Results web page, shown below, you can run a report showing you your unsubscribe list. To display the Results web page, simply click on RESULTS, at the top of the page. The unsubscribe list is a do-not-send or suppression list; so, even if you upload the same email address to a different database the email address will never be sent to again. All records remain in your database until you elect to delete them. What if I unsubscribe by mistake? It&apos;s easy to resubscribe to a mailing list; however, to honor the unsubscribe process, Relevant Tools verifies all resubscribe requests before they are processed. To request to be resubscribed to a mailing list, use the Contact Us form, shown below. To display the Contact Us form web page, click on HOME, at the top of screen, and then click on the "Contact Form" in the How to Reach Us column on the right–hand side of the page. I do want to keep receiving email from Sideways Wine Club because I always learn something new and Dave offers such interesting wines at great prices.